If you’ve been watching the Netflix series “Tidying Up with Marie Kondo” you’ve probably felt inspired to clean out your closets, determine which items “spark joy” and dispose of everything else. Early in the year is always a good time to declutter and sort through your belongings. As you’re creating piles and filling boxes with old clothes, housewares and even junk, make a plan to properly dispose your unwanted items before taking them to the curb or the landfill. Many of your items can be given a second life by donating, recycling or selling them. Keep reading to find out ways to dispose of your old stuff as you “tidy up” your life. If you find yourself with piles of clothes after “Kondo’ing” your closet, consider donating or recycling them instead of taking them to the curb. Goodwill has locations throughout West Michigan where you can drop off your clothes. If you have clothes that are in good shape, especially professional clothing, consider donating it to a nonprofit like the Women’s Resource Center in Grand Rapids to help those who need professional clothing for job interviews and work. Public Thread in Grand Rapids will accept your high-quality textiles, including nylon, wool and leather. And what about your ripped and stained clothing? H&M and The North Face, located in the Woodland Mall in Grand Rapids, will accept and recycle used clothing and give you a store discount in return. We are a proponent of keeping books that “spark joy,” but if you find yourself with a stack of books that are collecting dust, consider taking them to your local library, second-hand bookstore or school to see if they accept donations. You can also mail paperback books to soldiers overseas through Operation Paperback. Paper can easily be recycled in your bin or dropped off at your local recycling center. PaperGator has locations throughout West Michigan and accepts newsprint, catalogs/magazines, junk mail, phone books, office/school paper, and hard and soft cover books. If you’re shredding paper, put it in a clear plastic bag in your recycling bin. However, if you’re getting rid of old wrapping or tissue paper, these materials cannot be recycled in Kent County. As you declutter your kitchen and other rooms of your house, you’ll probably find yourself with stacks of dishes, kitchen utensils, appliances and other items you no longer need. Family Promise of Grand Rapids will accept gently used furniture and household items. For larger furniture pieces that are challenging to dispose of, there are a number of organizations – such as Salvation Army and Habitat for Humanity – that will pick up old furniture if you schedule an appointment. From retired technology to vinyl records to toys to tools you no longer use, there are options for recycling or donating these items. North Kent Community Services in Rockford accepts clothing, shoes, accessories, handbags, books, records, CDs, DVDs, working electronics, small working appliances, sporting goods and more. Computers, phones, tablets and gaming systems can be recycled at Comprenew, which has drop-off locations in Grand Rapids, Coopersville and throughout West Michigan. Valley City Electronic Recycling in Kentwood also accepts electronics. Remember to clear your devices’ memory before disposing of them. If you have unused medical equipment around your home, such as walkers, shower chairs, canes, raised toilet seats, and other basic medical equipment and supplies for reuse, drop them off at Love INC of Allendale. There are some items that can’t be recycled or donated. If you’re cleaning out your garage or basement, you may find old items like propane tanks, ammunition, batteries, medications and other hazardous materials, make sure to dispose of them properly. The Kent County Sheriff’s Department will take your old medications and ammunition. Propane tanks can be dropped off at the North Kent Recycling & Waste Center and the South Kent Recycling & Waste Center. For many people, sentimental items are the hardest to part with. If you’re having a hard time letting go of photographs, your child’s artwork or family heirlooms, you have some options to consider. First, Marie Kondo recommends displaying sentimental items that “spark joy” in your home. But if you find yourself with an antique desk that has been passed down through generations of your family, see if you can repurpose it in your home or if there’s a family member who could use it. If you have items that may have historical value, consider donating them to the Collections at the Grand Rapids Public Museum. 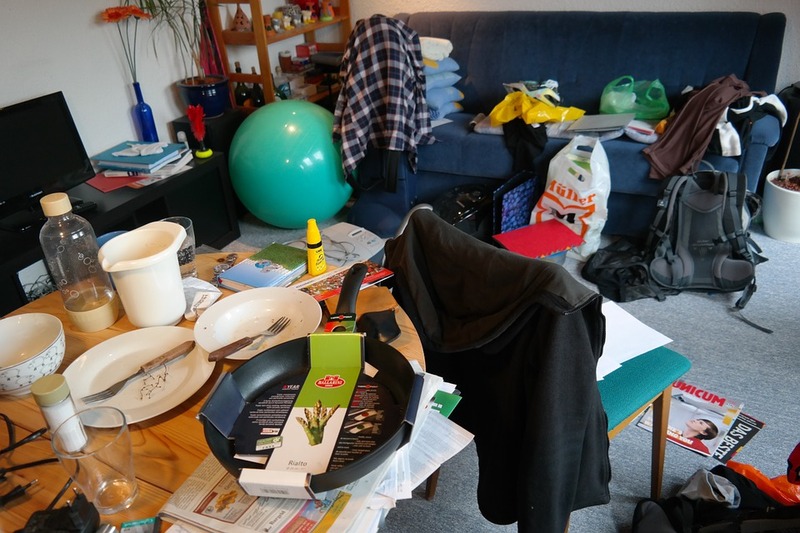 As you’re decluttering your life, take time to research your options for disposing of your items. Remember, many of your items can “spark joy” for other people, so give your old clothes, housewares and technology the opportunity to do so. By recycling or donating unwanted items, you can make a positive environmental impact as you “tidy up” your life, just be sure to recycle the right things. Search our recycling guide for a full list of donation, recycling, and disposal locations throughout Kent County.